You are about to begin a journey of and interesting, exciting place. The world of "Monoprints", with artist Toni aThe monoprint or monotype is often thought of as a halfway stage between painting and printmaking. The process is simple: the artist paints, rubs, or wipes the design directly onto a plate, using a fairly slow drying paint or ink. The fleeting image must be printed before the ink dries. 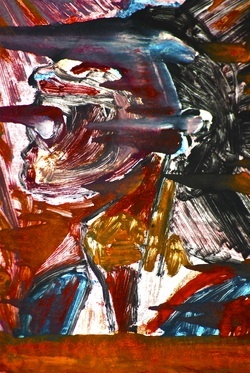 Printing may be by press or by hand, and as the name monoprint implies, one can usually get only one strong impression. The effect must be guessed right from the start; there will be no trial proofs or different states unless the design is redrawn for a second impression. This term is used to refer to any print made in one version and incapable of being repeated. 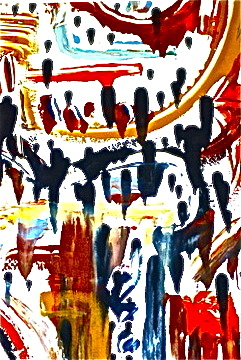 A monoprint cannot be editioned. 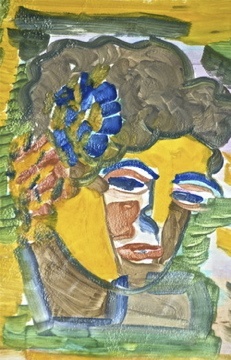 Monoprinting does allow the artist unusual freedom and spontaneity. The plate is often fiberglass or a similar flexible, durable and transparent material and you don't carve into the plate. If you do, that allows for repetition of images which is categorized as "monotype." I'm drawn to work that is entirely "unrepeatable" as the above implies. Toni Anita Gray. Song To A Flower. 2004. Monoprint. 14 x 17. 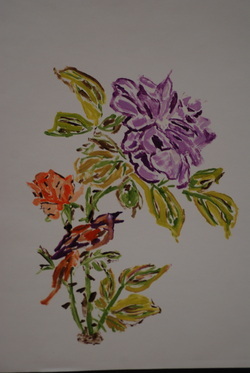 This monoprint tells the story of a beautiful bird that has fallen in love with a flower that is equally as beautiful. Each day he lands on its stem in the same spot and sings one of the most beautiful love songs a bird could ever sing. In carrying out this project, artist Toni Gray combined the ideas of stencils, artist stamp, using the format of monoprint to tell a story of love. The statement she makes here is one where we are not always able to choose whom or what we will love, love just happens. 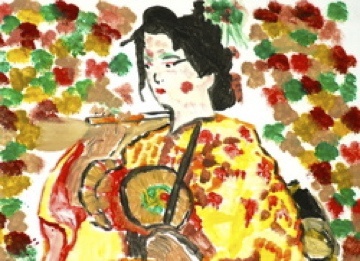 Her technique is similar to that of Chinese brush painting where Gray was teaching herself how to perfect this technique without using Chinese brushes. First sketching out the basic outline, smearing bits of pint with her fingers in place desire and finally pressing the monoprint of the image in place. Simply beautiful. 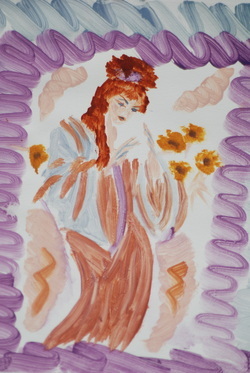 The color scheme is one of red-violets in various shades mixed with purple the royal color of God. The leaves and stems are their natural colors, however the bird is not. 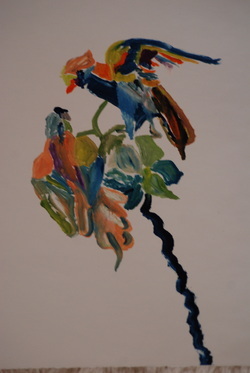 He is a red-orange bird singing next to a deep peach colored flower with pastel shades of peach lightened with white. This work appears to have texture; the goal to Toni but it is completely flat. Painting it to have the appearance of being raised a little off the paper helps in exaggeration and contrast. Her lines and finger strokes gives some feeling of distortion. The mood of this painting is one of solitude and joy; comfort and intrigue. just as the bird has with the flower and the flower with the song of the bird. Toni Anita Gray, LoveBirds. Chicago, Illinois. 2004. Monoprint, 14 x 17. 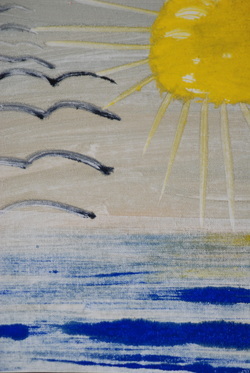 This monoprint tells a similar story of a beautiful single bird above. This is a special new series for the Artist. Here these birds are in love with each other and not a flower. They are not singing but gazing into each other’s eyes as humans do when in awe. Parched between one flowers these birds hold on to that one flower for dear life, not to fall off and thereby lose sight of the other whom is adored. Once again we have a play with stenciling and stamping in style, and a swirly line becomes the stem of the flower but its stem is not green but dark blue and not very realistic in its nature. The male bird colors are also dark like the stem but in his upper body the array of colors causes the female to be drawn to the color of his wings. With just a shocking punch of orange to get her attention he flutters his wings in a display of affection. The female is fascinated and sits quietly and enjoys the display of love. The position of the male bird is dominant and the position of the female is submissive in accordance with biblical Scripture. Although the song for us is silent, we can imagine its beauty as we reflect on the many beautiful songs we have heard birds sing daily outside our windows each morning. You do have an ear for bird music don't you? 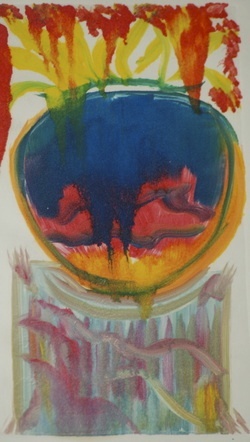 Well at any rate this monoprint, like the one above, is not only a display of love, vibrant colors that are complimentary and contrasting but also mesmerizing to the audiences. Morning Swim, Toni Anita Gray. Chicago, Illinois, 2004. There is nothing quite like a first swim in the morning. It is a real wake you upper and fantastic exercise. As you can see, the sun is extremely bright lighting up the water that appears to be an extension of the sun in the distance. The Seagulls above, all five of them are also enjoying the warmth and beauty of this golden morning light. The blue-violet water is assuring us that it is cooling to the skin and refreshing on a very hot summer morning. Violet our secondary color compliments our primary colors of yellow and adding a little green to yellow-orange gives us a glimpse of the landscape in the background to your immediate left. Only a few waves are in this lake today as the lake is calm, every flowing and filled with exercise and relaxation simultaneously. This mixture guarantees one a wonderful day going forward into the late afternoon hours. This monoprint is a lot more textured than the ones above as it was produced on canvas paper to add more texture. The artist loves the way that the paint sticks and does not seem to stick to the picture. This texturing adds interest and contrast for the human eye and offers a kind of fantasy and reality for the left and right sides of our brains. Toni A. Gray, SunSpots, 2004. Monoprint Collection, 10 x 14. A sunspot is a region on the Sun's photosphere that is cooler and darker than the surrounding material. In the work her the artist reversed the color of the spots making them white light instead of dark spots. Sunspots often appear in pairs or groups with specific magnetic polarities that indicate electromagnetic origins. They are defined as any of the relatively cool dark spots appearing periodically in groups on the surface of the sun that are associated with strong magnetic fields. Gray love to change the natural order of things sometime in her work of art and here is just one example. Again adding some texturing to increase artistic interest and contrast, Anita plays with our mind and our eyes. Toni Anita Gray, Tropical Black Gulls, 2004. Monoprint Collection, 10 x 13 1/2. Coral is the key color in this work. Black Seagulls over a coral lake and the further you venture outward the more coral you'll find. We all know that the lake is not coral but how beautiful that would be if this monoprint were a reality. Huge rocks are embedded in these waters so this is not a safe place for humans to play. Nevertheless, it is a beautiful place to imagine. The texture here is smoother, although the rock indicates that there is some danger in these waters. The huge black palm tree above tented wit hints of green and coral simply suggest that there is more in this background that we can actually see. The yellow sky is afar off and indication that morning is still occurring. The is a picture of the peace that is inherent in nature and also how rough nature can be in the midst of its own peace. Some sunlight appears on the water with a few streaks of sunflower yellow just to add interest and suggest tat the sun is still raising in the distance. Texture has it place in this peace but it is not the full essence of the work. Coral and the beauty found in its hues is this works essence. A coral lake, for man to encounter, with his imagination. Toni Anita Gray, A sea of rainbows, November 7, 2004. The art experience is unlike many other experiences. Why? Because it is so very personal. In art we read a story of visual language but you must have some knowledge about the images you view beforehand. This means we must really learn how to see when viewing any kind of work of art. Perceiving is looking at and thinking about what you see or think you see. The goal is always learning how to see art. Let's begin the journey with this monoprint. What's in the background? What’s in the sea? Is what's in the sea realistic or an artistic rendition of reality? The background is very fait but it is a city of one sort or another. A city made of mostly blue hues. Blue usually represents water, ice, and cold climate. This is an "Ice City" surrounded by a sea of rainbows that hover over the waters and confirm a kind of covenant as seen in Scriptures suggesting no melting and "No Flooding.” The huge Seagulls above are half the size of the rainbow in the foreground as we look beyond the rainbow in the background. The water is not calm based on the jaggedness of the waves and the length of them. There is no sunlight, yet the scene, is bright enough to see. This is a different kind of light unlike the light we are accustomed to on planet earth. There is a lot of pure white light not a yellowish light that humans encounter on Earth. There are no people in the foreground but the suggestion of a life form in the background city. 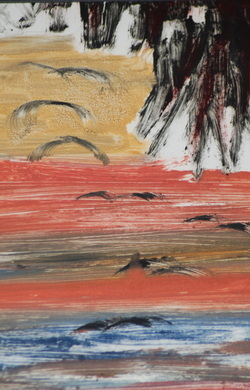 This monoprint focus on the planetary differences between our planet and the one you are viewing. They are very different except for the existence of seagulls and rainbows that sit on top of the sea and not in the skies. Palm Trees, November 7, 2004. Monoprint Collection, 17 1/2 x16 . Art is very challenging to the minds of humanity. What Gray tries to do is to prepare you to use your eyes and mind and creative senses to understand her many different kinds of abstract works of art. What is intriguing about the monoprint of "palm trees" is their shape differs from each other greatly much like each human has a different shape. The leaves are quite different on each, one is full and very spread out while the other is less full, shorter and grow much closer together. The trees are also a bronze color not brown or brownish green. They are set in bronze sand, behind them is water, and then behind that even more bronze sand. The skies are a silver gray so it is not a sunny day, yet the palms are there, soaking up whatever the air, skies, water, and sands have to offer. These objects are not meant to be intentionally drawn well for they are abstracts of real life of a beachfront scene. Here we are looking at art through artist Toni Gray, and her goal is to assist us in developing our own powers of creative thinking. We are to look for fresh and exciting new ideas in the work that reveals different ways of expressing the ideas we have become familiar with "Palm Trees.” A lot can be gained by looking at the artwork of others, you can learn how to perceive artistic ideas and concepts; develop you creative thinking and find ways of expressing your newly found ideas involving artistic tools and techniques. Palm Trees, in a silver gray background suggest richness (the color of silver-gray). Bronze suggests wealth as well. Even the Seagulls in this monoprint are silver gray and bronze. It is clear that they dwell in a place of richness, comfort, and wealth. What feeling and ideas does this work of art give you? What would happen to those same feeling and ideas if this work were painted from a different point of view? What can you do as a viewer to become more of a participant who is perceptive of his or her environment such as this one in this artistic work called Palm Trees? Ms. Chinezia In the Chinese Garden, November 7, 2004. Monoprint Collection, 17 x18 . Enjoying art is an art form of its own. Pretend you are in a museum and this monoprint is hanging in front of you. This has lifelike details, but the subject, composition and content of this work is what important. It is defined in terms of aesthetics. The goal is to identify what is important in a work of art. When discussing artwork, this piece would not work well hung upside down but there are other works of art that do. In this work there is nothing in the art to give the impression of ground except the trees behind the woman, she almost appears to be floating in space and time. She is the center of attention, very beautiful and seems to be at peace. He hair is perfect; her walk appears very graceful and slow enough for you to see the flowing movement of her customary wardrobe. She looks at nothing but appears focused on the substance upon which she walks. What is that substance? What mood might this monoprint change if there were more objects in the work of art? The lines in the work are linear and very curvy. What is the representing? Wind? Correct, a gentle wind that causes her garment to float or appear to be floating. There are no sharp edges in this work; everything is pretty rounded and curved to give the essence of gentleness and softness. In regards to personality and character, kindness and care. But the colors of red suggest turbulence in all this calmness, possibly the turbulence that is approaching. Here we are studying in this monoprint the aesthetics and aesthetic views. This helps us evaluate art. This kind and gentlewoman has low self-esteem but is kind to everyone she meets and knows. Her mood and feelings are not yet turbulent but turbulent is lurking nearby. What actions could have caused this mood? What do you say and do to others that alternate their moods? 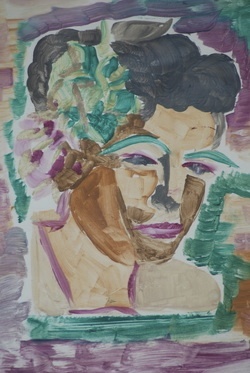 How to you feel now that you have experienced the moods and feeling of this beautiful woman in this moving monoprint?